A complete, daily schedule for all core and non-core subjects. These lesson plans clearly prioritize core and non-core subjects, allowing you to juggle family life, build an academically excellent education, and instill a love for learning! Introduction & FAQ: An extensive resource with practical advice and encouragement to make your year a joyful one. Comprehensive Subject Guide: This handy guide offers specific teaching helps for each subject. Full of tips and suggestions! Daily Lesson Plans: Two page-per-week format. Weekly checklist goals are placed alongside daily plans that offer flexibility and guidance without formality. Core subjects are shaded to make it easy to prioritize. Year At-a-Glance Chart: Lists the topics covered by subject and week; particularly helpful when you come across additional enrichment material you wish to incorporate. Just check the chart to see which week the topic is being taught and then insert your notes/materials in the lesson plan. "Typical Course of Study" and "Achievement Record": Useful for record-keeping purposes and/or to fulfill state reporting requirements. 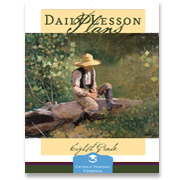 The daily schedule within this lesson plan is written directly to the student. Although parental involvement is still important, the student is encouraged to complete most of his schoolwork independently. Study Guide for Earth Science: This essential resource includes enrichment links, suggested schedule for vocabulary practice, instructions for writing the assigned research paper, and resources on the debate over global warming. "Faith in Action" Student Course: As the capstone of his elementary-level study of religion, the student will complete a year-long series of volunteer projects. The "Faith in Action" student course provides scheduling suggestions, a variety of ideas for volunteer service projects (many of which the student can complete at home without parental assistance), and step-by-step charts to assist the student in scheduling and planning his projects. Five days a week, 36 weeks. 178 pgs. Loose-leaf, 3-hole drilled, shrink-wrapped. Take a tour of the Eighth Grade Lesson Plans and materials!